When I "finished" my car I got an email from a Heinkel friend in England that basically said "Congratulations, now you'll probably spend as much time adjusting and debugging as you did restoring!". He's been right so far. I've been using a free iPhone app as a speedo, and at this point I'm pretty good at estimating my speed within a few miles per hour with or without it. 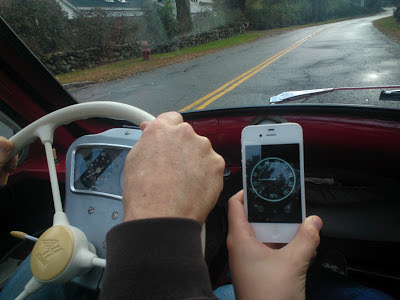 While the GPS speedo is useful for keeping the passenger occupied (and their mind off of my sometimes terrible shifting), wouldn't it be nice to have a real speedometer and odometer? On a good day I can get up to 40 miles per hour with my drill, which is almost as fast as I can drive! Once I ruled out the speedo again, I took a short drive to see it the cable was actually spinning. In my case, it wasn't. This means the problem is back where the cable attaches to the speedometer drive on the swingarm, or the connection of the speedo drive connection to the small chain gear that runs off of the engine inside the swingarm.